Another year, another season of everyone’s favourite horror soap opera. In recent years, the show has decreased in quality as filler episodes have become the norm and stretched out, meandering plotlines are the modus operandi. Is Season 7 a return to the show’s early form, or does it merely continue this trend? Of course, it goes without saying that spoilers lurk in the review below. If you’re not up to date on the show, I’d suggest you steer clear. 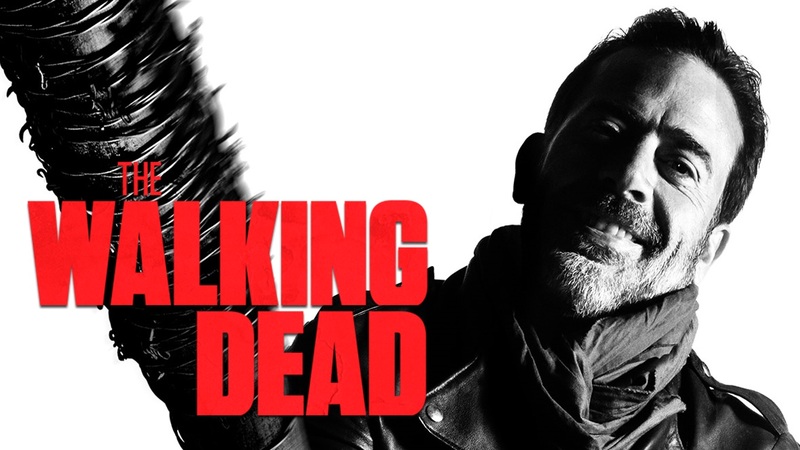 Firstly, and perhaps controversially in the eyes of many of the show’s watchers if social media comments are anything to go by, Jeffrey Dean Morgan’s Negan is the finest thing to happen to The Walking Dead in years. Charmingly terrifying and darkly hilarious, Negan is like a breath of fresh air for the show – not since David Morrissey’s Governor have we had such an intensely watchable villain, posing a genuine threat to our heroes and giving the series high stakes again. The zombies are just background noise now. The Walking Dead has always been at its best when a strong human villain was in charge. Other new characters – such as Khary Payton’s King Ezekiel – also bring some new life to the show but it is the baseball bat wielding leather-clad psycho who makes this season his own. And incidentally, the payoff from Season 6’s cliffhanger is handled remarkably well, with the deaths of our beloved Abraham and the long-foretold violent end of Glenn. I was one of the very few people who thought that cliffhanger in question was incredible, too…Fight me. And the main bulk of our heroes are on good form, too. Rick (Andrew Lincoln) spends most of the season in rather submissive and cowardly role, but when his balls grow back, we cheer for our bearded leader. Daryl is a little broken for the first chunk of the season too, held prisoner by Negan – but his escape and reunion with the gang is both intense and emotional. This season itself could be considered one long trailer for the next one, with all of the pieces getting put in place for the All Out War plotline. And yet, the majority of it (with some exceptions) does not feel like filler. This is a slow-burner, but the payoff next season could just be the best of The Walking Dead yet. In summary, all of the positives of The Walking Dead’s 7th season are really down to Negan. When the plot is moving slowly, the presence of Negan – even when he’s off screen – is felt and feared, making the show far more intense than it’s been recently. We fear for the safety of our survivors once again, and this “new world order” makes the world of The Walking Dead a dangerous place to be. But that being said, if all of the survivors were to meet their grisly end at the end of Negan’s beloved Lucille, I wouldn’t be too bothered. Negan could lead this show, easily. But, of course, this is The Walking Dead. Even with Negan’s presence, the plot does often come to a complete standstill – for multiple episodes at a time. Some subplots are utterly tedious, with an entire episode dedicated to Tara’s brief time at an all-female camp by the ocean, a particular low-point. But, this comes with the territory of The Walking Dead. It always has. We know to expect this filler, and we know it’s worth enduring because the good episodes can be incredible. We all know that bold statements by our characters like “we’re going to war” often mean “we’re going to war in 20 episodes’ time”, but that’s okay. The fans who’ve stuck around know that the show can dip wildly in quality even during a season, but when it grows back up to the heights it’s capable of, it is incredible television. It’s difficult to summarise a 10 hour-plus season in so few words, but as I look back on this season of The Walking Dead, I honestly can’t remember much other than Negan. While some might think that could be considered a criticism, it isn’t. It’s not to say this season was forgettable – it’s rather to say that Jeffrey Dean Morgan was so utterly incredible in every single scene, he has single-handedly made Season 7 of The Walking Dead one of the finest seasons yet. I, for one, cannot wait to see what he gets up to in the upcoming episodes of the show, and I’m filled with excitement and joy for the future of the series – something I couldn’t have said a couple of years ago. Welcome back, The Walking Dead. You were always there, yes – but the lights were on, with nobody home. Now, the lights are on, and you’re having a god-damn house party. Long may it continue. The Walking Dead is back to near-perfect status. Next season could be a 5-star belter.